Our Rockbridge Elite series is designed to offer the flexibility your family needs and the style that you don’t want to live without. 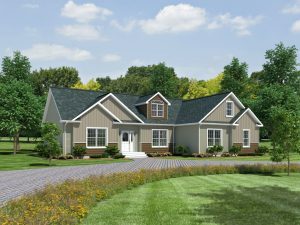 The Rockbridge Elite 6 is a four bedroom and two bathroom ranch with some great additional standard features! A large formal entry foyer welcomes you into the RY503A, it is open into the Great Room, and the Dining Room. The formal dining room off the entry foyer has a beautiful tray ceiling and recessed lighting standard. The enormous Great Room is a fantastic space for the whole family! The Kitchen is a large open space with a center island dividing the Kitchen and Great Room. This Kitchen has great storage space with a large amount of cabinetry. Built-in Microwave and Wall Oven in the Pantry, with a Surface Burner Cook top, Dishwasher, and a 23 CuFt Refrigerator are standard in the Elite home. A family room is off the Kitchen hallway, another great spot for entertaining and family. The three secondary bedrooms are off the family room as well as the second bathroom, and utility room. The Master bedroom is off the Great Room and is a large space. The Master Bedroom includes a large walk-in closet and Master Bathroom. The Master Bathroom has double sinks, a ceramic tile shower, and a separate commode closet. The Elite home series has great additional features and will make a great home!